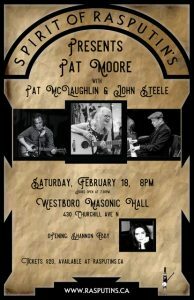 Joining Pat is Pat McLaughlin on acoustic guitar and mandolin. Pat has made quite a name for himself with his inspiring backup and lead playing. 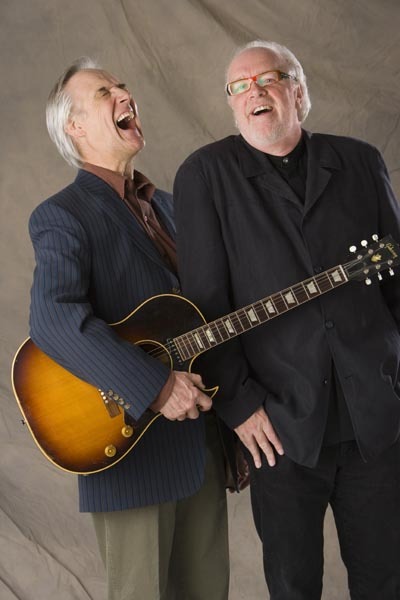 He is a much sought after player; can also be seen playing with Trevor Alguire, Ball and Chain, as well as in the travelling show “Grievous Angel, The Legend of Gram Parsons.” His vocal harmony brings a warm full sound to the songs. Rounding out this trio is multi-instrumentalist John Steele, is one of the region’s most soft-spoken, but highly regarded, musicians. 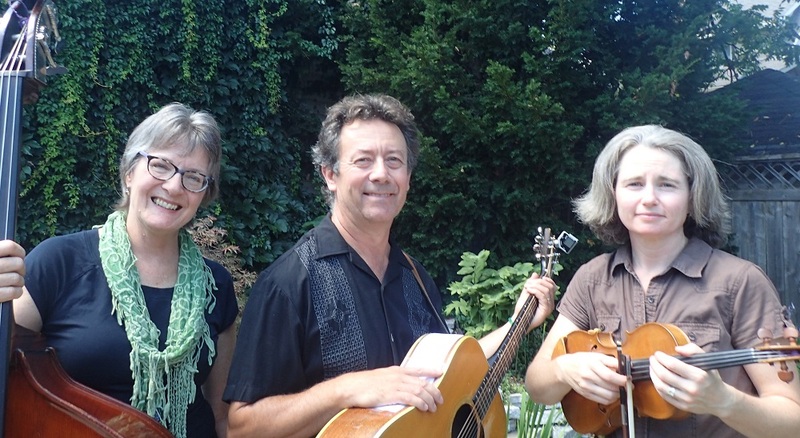 “He’s one of the finest musicians in the Ottawa Valley,” says Renfrew’s Mill Music owner Steve St. Michael. 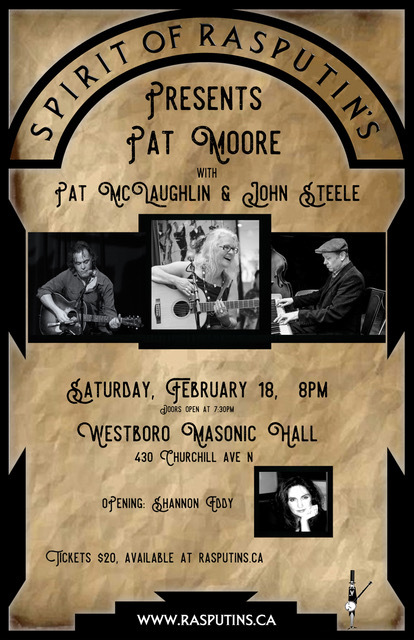 BREAKING NEWS: Pat Moore’s trio with guitarist-mandolinist Pat McLaughlin and pianist John Steele will become a quartet with the addition of swinging acoustic bassist and cellist Ken Kanwisher. He played on Pat Moore’s first solo album and is a member of John Steele’s Western Swing Band. Opening act is Shannon Eddy, a singer songwriter who glides effortlessly from folk to blues to jazz on piano and guitar with a strong voice and excellent musicianship. SOLD OUT!! Thank you ! 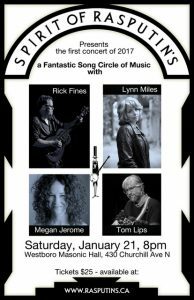 Rick Fines and Lynn Miles, two of Canada’s most accomplished singersongwriters, will team up with outstanding Ottawa talents Megan Jerome and Tom Lips at Westboro Masonic Hall in Ottawa on Saturday, January 21. 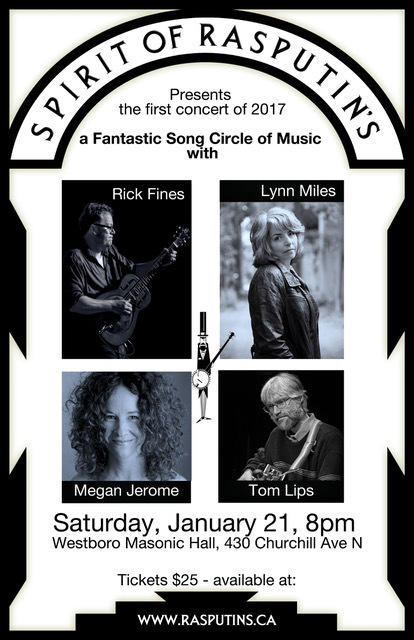 Folk, blues, roots and jazz sounds will be on the menu as the four artists share the stage to trade songs in song-circle format. 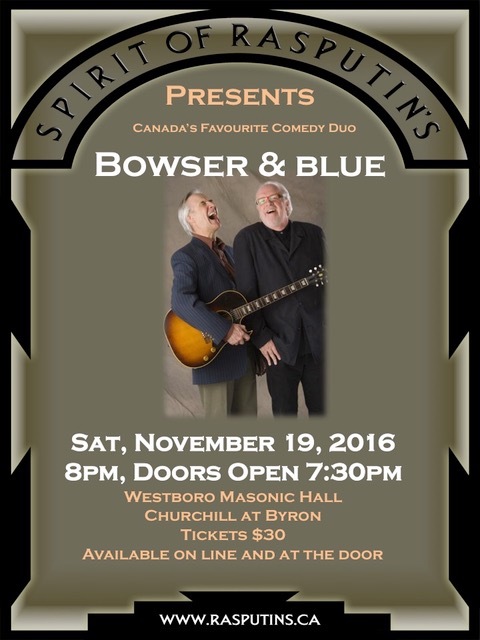 This will be the first event of 2017 in the Featured Artists Series of Ottawa’s folk music society Spirit of Rasputin’s. been described as bold, intimate and full of light. She brings a singular artistic voice to her performances whether with a full band, in small combos or as a soloist. “Megan wears her heart on her sleeve when she sings but is not afraid to look you in the eyes as she does it. 430 Churchill at Byron Advance tickets are sold out to 95% capacity. Thank you! A few tickets will be available at the door between 7 and 7:30pm. The second of our 2016-17 Featured Artist concerts is coming up October 29th with HISPANIA! a concert of beautifully unusual and rarely performed repertoire of Medieval and Renaissance Spain. Soulful ‘Romances’ of the Sephardic Jews are interwoven with songs of courtly love and tragic loss, and in the second half, you are invited to cross the ocean to hear a variety of rhythms of the Spanish diaspora in South America. and Celtic harp duo Acacia Lyra, with Janine Dudding and Susan Sweeney Hermon. 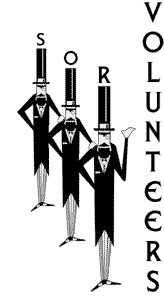 The Spirit of Rasputin’s Arts Society is kicking off its Featured Artist concert series for 2016-17 this coming Saturday September 17 with the Tony Turner Trio. Tickets, $20.00 can be purchased online through Paypal (https://www NULL.paypal NULL.com/cgi-bin/webscr?cmd=_s-xclick&hosted_button_id=PXM9X26Y45TEQ) or at the door on the day of the concert. Hispanic and Sephardic songs across the ages and continents. Acacia Lyra, (harp duo with Janine Dudding and Susan Sweeney Hermon), Sylvia Larrass (soprono), Greg Weeks (cello), and Graham Lindsey (flute, percussion). 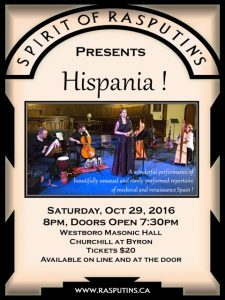 Haunting early Spanish and Sephardic music, as well as traditional and contemporary songs of Latin America. Tickets, $20.00 can be purchased online through Paypal (https://www NULL.paypal NULL.com/cgi-bin/webscr?cmd=_s-xclick&hosted_button_id=VZ8WZ2TGPQDD8) or at the door on the day of the concert. George Bowser and Rick Blue write and perform music and comedy. In 2011 their latest work; “Schwartz’s – The Musical”, inspired by Bill Brownstein’s best-selling book about the Montreal Delicatessen, ran for nine sold-out weeks at Montreal’s Centaur Theatre. Tickets, $30.00 can be purchased online through Paypal (https://www NULL.paypal NULL.com/cgi-bin/webscr?cmd=_s-xclick&hosted_button_id=WSEL2F9M7RHWL) or at the door on the day of the concert (if not sold out!!). Previously the date was announced as May 8, then May 15, but due to certain critical reports not being available on time the date has been pushed to Sunday June 12. This time we’re sticking to it! Two directors’ terms end this year, one of whom is not standing for re-election. Please consider throwing your hat in the ring. Sitting on the Board of Directors is not a lot of work but it is important work for the health and guidance of the organization. If you wish to table a specific topic for discussion or an amendment to the by-laws please send an email to board@rasputins.ca with details. If you cannot attend but wish your vote to count simply assign your vote by proxy to someone else. A signed handwritten note stating to whom your vote is assigned will suffice. Membership renewals and new memberships will be available at the start of the meeting. At Chrysalis songwriters are tasked to sing other Ottawa area songwriters’ songs! The intention is to give songs a re-birth (hence the name of the event).